The V130 head is the amplification equivalent of a Land Rover; you can take it practically anywhere musically, as well as geographically. Big overdrive range that can handle practically any genre. It would have been a bonus if the effects loop was footswitchable. New off the release decks is the very powerful V130 Super Countess head. It sits in Victory’s Heritage range, which means traditional wooden cabinet: the head is finished in black. There’s a fair amount of internal wiring with its extra pair of valves and dual footswitches. The head’s compact dimensions mean it’s very portable and not too heavy either, despite the substantial transformers. 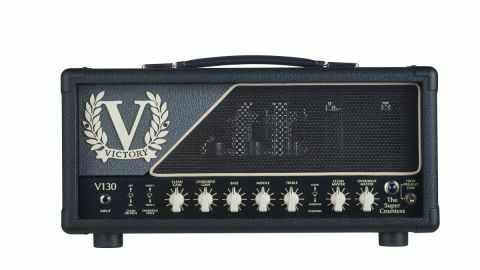 The V130 Super Countess head is adapted from the V30 Countess developed for Guthrie Govan as his ‘flying amp’, and offers two channels, with separate gain and volume controls and a shared EQ. Both channels have two separate voice options: the clean channel can be switched to a crunch mode, while the lead channel has two distinct voices. Both are footswitchable. There’s a high/low power option from the front panel standby switch, which Victory now calls ‘Preheat’ to avoid any legal ambiguity concerning EU legislation on electrical equipment standby modes. On the rear panel are five speaker jacks, with external bias test points and an adjustment screw, a series effects loop and a pair of sockets for the supplied footswitches, which change modes and channels. It exudes solid reliability - it’s built to handle the full-on assault of continuous touring and perform consistently night after night. We tried the amp in studio and live band settings with a variety of guitars. The V130’s slightly edgy clean tones and punchy dynamics easily cut through any band mix, with headroom to spare thanks to the quartet of JJ 6L6 power valves. Switching into crunch mode adds a healthy dose of overdrive, more than enough to qualify as a great classic rock solo sound, while the V130’s two lead modes add more of the same, with overdrive sounds that borrow from the best of British and American, tweaked with Victory’s own harmonic sparkle. Voice I is new and offers a tighter bottom end and slightly lower gain than Voice II, the classic heavy, thick V30 overdrive sound. Impressively, even on very high-gain settings, the guitar’s character still comes through, making those bigger lead sounds great fun to use. The V130 head is the amplification equivalent of a Land Rover; you can take it practically anywhere musically, as well as geographically. We think it’s the most versatile amp Victory has made so far, and with a proper 100 watts to get your point across, it’s well worth the asking price.